You will require your PIN to login to your Library Account. From the e-Wits Catalogue click on the login link and follow the prompts that follow. Below is a Screenshot example of the page. Click here to login OR create your profile. Keep your PIN safe - you will need it each time you use the Library Catalogue or Electronic Resources. Accessing E Resources off campus or your Library Account requires a PIN. When logging in for the first time enter any 6 digit (numerical) Personal Identification Number (PIN) you would like to use. After clicking "Submit" you will be prompted to verify the PIN. This service acts to protect against possible unauthorised use of your account. Click here to reset your PIN. Library cardholders may renew their own materials online. All material may be renewed except for materials with holds or on short/overnight loan. Item may be renewed up to four times if it is not required by another person. Renewals may be done at the Issue desk, or online by loging in to your Library Account: if a hold has been placed on the item, or it is already overdue, the renewal will be rejected. Postgraduates and staff may also renew items by telephone. You can now pay any fine using KuduBucks with your Student Card or by depositing money at the Cashiers Desk (please ask your Librarian for the account code). Fines are charged to all users, regardless of status, for any items which is returned after the due date , and which has not been renewed. If a renewal is made after the due date, a fine will be charged for the period of time between the due date and the date the item is renewed. Fines are charged per day or per hour, according to the category of loan, and are incorporated into the computerised loan circulation system. Please ask for a receipt of payments made and keep it safe! As a courtesy, the Library sends email reminders about due dates. E-mail notices will be sent to all current staff and student Wits email address. Whether or not you receive such a notice or reminder, books checked out to you must be returned or renewed by their due dates. If books are not returned and if replacement charges and outstanding fines are not paid, then disciplinary proceedings may be instituted by the Library. Interlibrary loans (ILL) supports Library collections for University academic staff and postgraduate students. 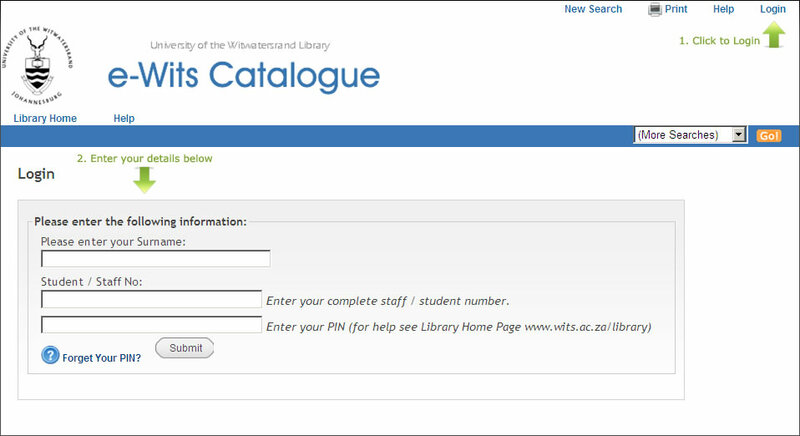 Requests from Wits University staff and students may be made using the Interlibrary Loans web site. Alternatively, requests can be made by e-mail, fax, or on paper forms available from the ILL office, or any Branch Library. The more detailed the information supplied (i.e. author, title, international standard book number (ISBN), edition, publisher and date of publication, in the case of books; and journal title, volume, date, author and title of article and page numbers, in the case of journals, the more rapidly the item is likely to be supplied. The central ILL service for the University is based in the Wartenweiler Library, on the East Campus of the University, and is situated on the First Floor. Wits Health Sciences Library requests should be made directly to WHSL. Email ill.whsl@wits.ac.za or phone 27 11 717 2350 for more information.